Competitively priced office and work space designed to modern standards and benefit from good natural light. Each office has its own alarm and network points with a communal reception and meeting rooms and canteen. Storage facilities are also availability on-site. Situated in a prominent location off Edinburgh Way (A414) the centre affords access to the M11, M25 and Stansted Airport and enjoys a 30 minute rail link to London Liverpool Street. Flexible or long term lease agreement available by arrangement. Based in Harlow, this centre has 54 office units available in a vast array of sizes, making it an exicting proposition for both younger, growing businesses and more established businesses seeking new surroundings. It boasts a wealth of amenities, including a great onsite management team dedicated to easing your transition and helping you with anything they can - including networking assistance and supply chain opportunities, an abundance of meeting/conference rooms (five in total), and 24-hour access. It is an ideal setting for those looking for office space in the London/Stansted/Cambridge corridor, and benefits from a superb location, with tenants being able to be within the confines of the M25 within 20 minutes, and Harlow Town rail station offering direct access to Liverpool Street. This modern business centre in Harlow Business Park has a variety of managed accommodation including offices, meeting rooms, studios and workshops, available on short term contracts. A full range of business support including reception, mail services, secretarial and admin are offered. The telecoms and IT systems are state-of-the-art. 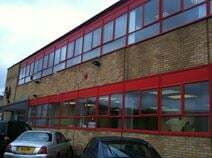 The centre is situated two miles from Harlow town centre and close to the A414. A wide variety of premises including modern managed offices, warehouses and workshops, with the option of flexible monthly licences, are on offer at this business centre in the Pinnacles East industrial area. There are free car parking spaces and a cafeteria on-site. The site is a short drive from Harlow town centre, the railway station and the M11 & M25 motorways, so is very well connected and accessible. This work centre offers a modern and bright place to work. The offices are very spacious and are in a great location. Within walking distance is Harlow Train Station, providing fast rail links into London. The work centre has many great amenities, including a cleaning service, meeting rooms and on-site car parking. Within walking distance of the work centre are many great shops, restaurants and bars.